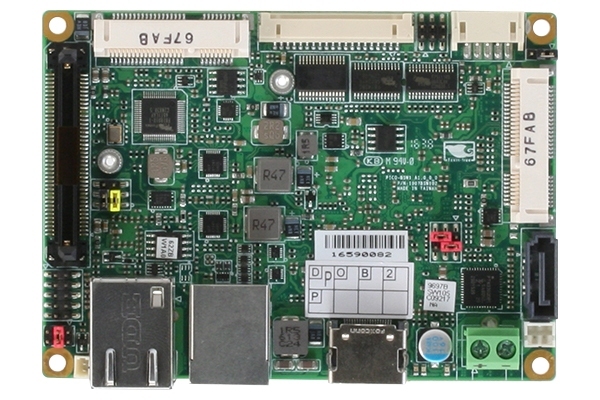 EMAC, Inc.; a leader in compact low power single board computer design and manufacturing has created the iPAC-9X25. Made in the USA this industrial strength embedded single board computer is based on Atmel AT91SAM9X25 Processor. It has an industrial temperature range of -40C to 85C and utilizes 4GB of eMMC Flash, 16MB of Serial Data Flash (for boot), and 128 MB of DDR RAM. ARM926EJ-S 400 Mhz Processor with 133 Mhz System Bus and JTAG debugger capability. MEMORY: 16MB serial Flash, 128MB DDR2 RAM and 4GB eMMC. DIGITAL I/O: 20 x General Purpose SAM9x25 Digital I/O lines, 16x SPI I/O Expander Based Digital I/O lines, and 8x High Drive Digital Outputs. PWM: Up to 4x 16-bit PWMs. ANALOG INPUTS: Up to 7x channels of 10 bit A/D 0 – 2.5 volts. COMMUNICATION: 4x Serial Ports (3x RS232, 1x RS232/422/485) and 1x CAN Bus. ETHERNET: 2x 10/100 BaseT Ethernet with RJ45. USB: 2x USB 2.0 High-Speed Host Port, 1x USB 2.0 Full-Speed Host Port and 1x USB 2.0 High-Speed Device Port. FLASH DISK: MMC/uSD Flash Disk socket. INTERFACES: SAM9x25 SPI, I2C and I2S. 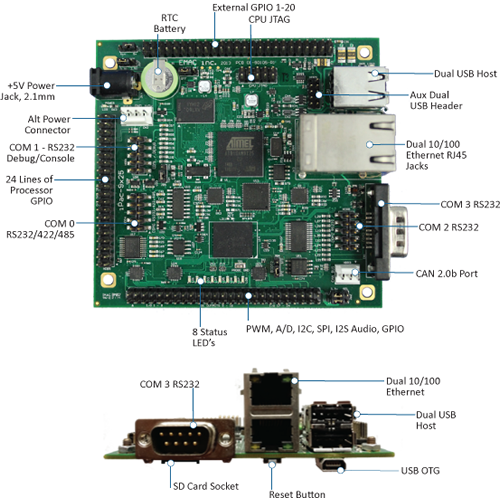 The iPac-9X25 is a web-enabled microcontroller with the ability to run an embedded server and to display the current monitored or logged data. 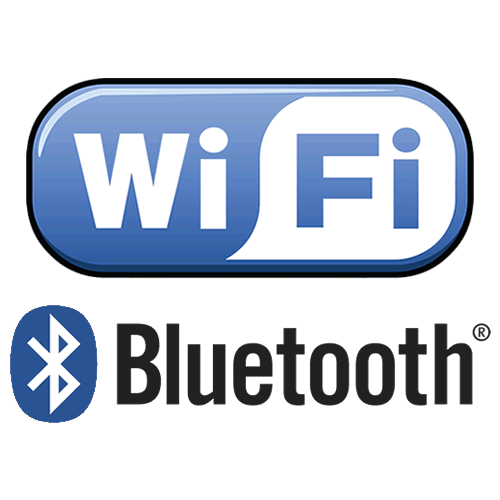 The web connection is available via two 10/100 BaseT Ethernet ports or 802.11 wireless wifi networking when using the proper Linux modules and adapters. 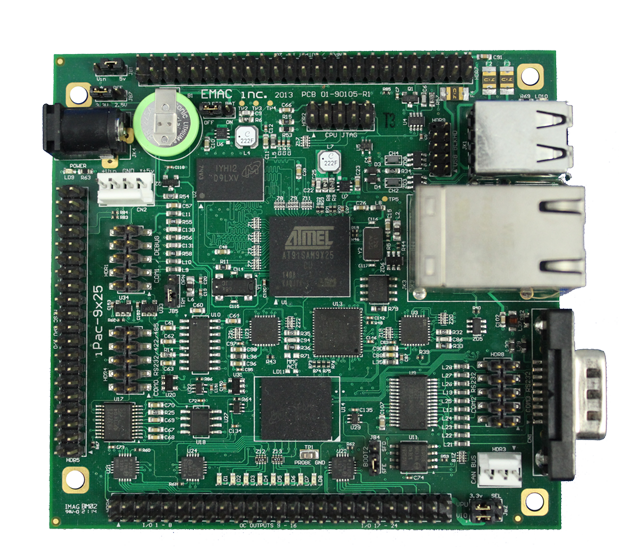 This Microcontroller has all connectors brought out as headers on a board and has the same footprint of a standard PC/104 module at 3.77" x 3.54". The iPAC-9X25 is perfectly suited for Industrial Temperature Embedded Data Acquisition and Control applications. The iPAC 9X25 has one (1) RS232 serial port with full handshake (RTS/CTS/DTR/DSR/RI), two (2) RS232 serial ports (TX and RX only), one (1) RS232/422/485 serial port with RTS/CTS handshake, two (2) 10/100 BaseT Ethernet ports, two (2) USB 2.0 Host ports, and one (1) USB Device port. The board has 7 channels of 12 bit A/D (0 to 3.3 volt) and an internal real-time clock/calendar with battery backup. It also includes 21 GPIO (3.3 V) lines on header, 8 high drive open collector dedicated digital output lines with configurable voltage tolerance, 16 GPIO (3.3V) on header, 2 PWM I/O lines with additional 4 PWN lines shared with A/D. The iPAC-9x25 has 5 Synchronous Serial I/O lines (I2S), 5 SPI lines (2 SPI CS), I2C Bus, CAN Bus, a micro SD socket, an external Reset Button provisions and red Power and Green status LEDs. 133 Mhz System Bus and JTAG debugger capability.